Fermentation is one of the oldest food processing methods still used today. Scientifically known as zymology, it is the conversion of carbohydrates into alcohols, carbon dioxide, yeast, or bacteria. Beer, miso, sourdough, kefir, kimchi, and many other delicious foods we love are the product of fermentation. In this course we will cover the basic science behind making sauerkraut, why it’s good for you, and we’ll teach you how to make it yourself. If you are interested in Old World food preservation, gut health, or fermentation in general, this is the class for you! In this course we will cover the basic science behind making miso, why it is good for you and how to make it yourself. Miso is a traditional Japanese product produced by fermenting soybeans with salt and the fungus Aspergillus oryzae called Koji. High in protein and rich in vitamins and minerals, miso played an important nutritional role in Japan. We will cover soy miso and non soy miso’s in this class. Fermentation is one of our oldest food processing methods. Scientifically known as zymology, it refers to the conversion of carbohydrates into alcohols, carbon dioxide, yeast, or bacteria. We'll cover the basic science of how to ferment tea to make kombucha, how it can improve your gut health, and ways to brew it yourself. You'll try your hand at preparing a drink and some fruit leathers. All participants will take home recipes and a starter culture. Join Master Fermenter Cheryl Paswater of Contraband Ferments for a hands-on class on making, and working with, miso! High in protein and rich in vitamins and minerals, miso has played an important nutritional role in Japan for centuries. In the traditional recipe, soybeans are fermented with salt and the fungus Koji, or Aspergillus oryzae. Explore the science behind making miso— both with soy and without, why it's good for you, and how to prepare it yourself. You'll walk away with recipes and techniques for making miso from soybeans, black beans, and nuts at home. While there are more choices on the market now for sparkly fermented beverages made with healthier ingredients, like kombucha and fruit sodas made with real fruit and cane sugar, they can be a bit on the pricey side. Fortunately, it is fairly easy to make these delicious beverages in your home kitchen. Join us to learn how to make your own fizzy herbal sodas, talk about the science behind them and why they are good for you! From Ginger Beer to Tepache we'll teaching everything you need to know to get you started! Fall Ferments: Sauerkraut and Beyond! Scientifically known as zymology, it is the conversion of carbohydrates into alcohols, carbon dioxide, yeast or bacteria. Beer, miso, sourdough, kefir, kimchi and many other delicious foods we love are the product of fermentation. In this course we will cover the basic science behind making sauerkraut, why it’s good for you and we’ll teach you how to make it yourself. If you are interested in Old World food preservation, gut health or fermentation in general, this is the class for you! 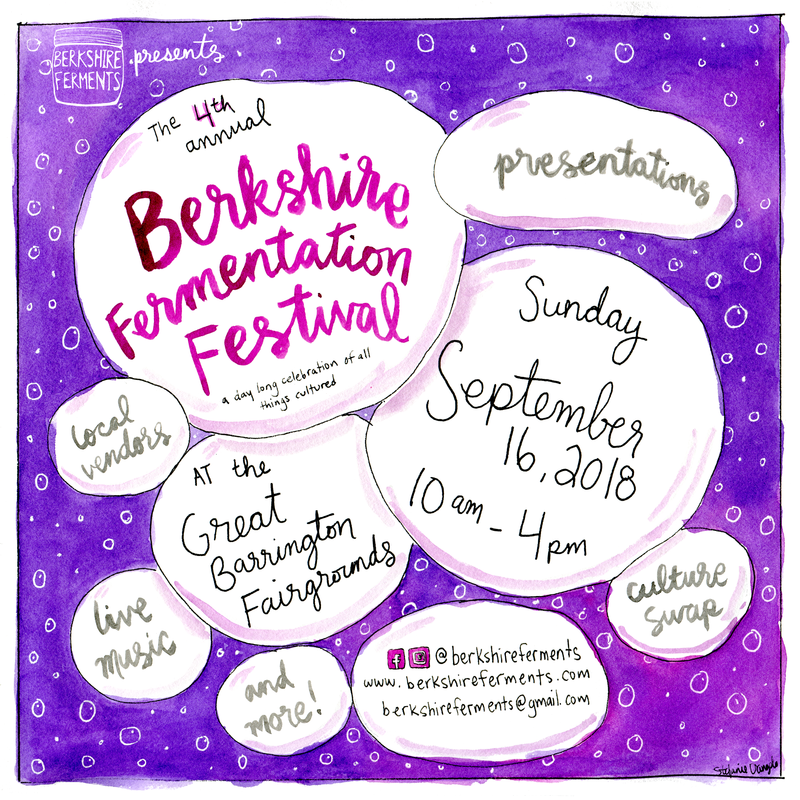 We're headed to the Berkshire's for the 4th Annual Berkshire Fermentation Festival! We'll be there teaching on Miso and hanging out so come join us and don't miss it! Visit www.berkshireferments.com to find out more! We're headed up to the Berkshire's! Join us for our workshop on Fermented Herbal Sodas at the Great Barrington Library! And stick around for the Berkshire's Fermentation Festival the following day at the Great Barrington Fairgrounds! Brace yourselves for these fizzy, buzzy, sodas. While there are more choices on the market now for sparkly fermented beverages made with healthier ingredients, like kombucha and fruit sodas made with real fruit and cane sugar, they can be a bit on the pricey side. Fortunately, it is fairly easy to make these delicious beverages in your home kitchen. Join us to learn how to make your own fizzy herbal sodas, talk about the science behind them, and why they are good for! Visit http://gblibraries.org/ to sign up! We're teaming up with the rad ladies at Supernatural for an amazing night of Fermentation and Herbal Medicine! Join for a demo and workshop on Sauerkraut and it's health benefits and stick around for some herbal medicine magic complete with take-home goodies! We're headed to Boston for this years Boston Fermentation Festival! Come visit us at the Fermentation Troubleshooting Booth and more! Visit www.bostonferments.com for more details! Learn to make your own dairy-free and probiotic-rich nut-based cheeses with Brooklyn-based Contraband Ferments. In this class, we will teach you the principles of making cheese using a variety of nuts and seeds. You’ll learn basic skills in fermentation, the history behind fermentation, and a variety of ways to make soft and hard-rind cheeses, as well as recipes using nut cheese. Raw Fermented Cashew Cheesecake anyone? We're headed to Toronto! Join us at our upcoming Miso workshop at The Depanneur! We're headed to Canada!! The Ontario Fermentation Festival is happening and we'll be there teaching on all things Miso! Visit www.ontariofermentationfest.com for more details!